George was born and raised in Lesueur Center (Le Center), Minnesota. While in high school, he participated in all sports and was captain of the football team. It was then that he first caught the eye of his wife, Luciel, who was a cheerleader for the sports teams in the neighboring town of Montgomery, Minnesota. After attending business college, George worked for the Ford Motor Company. 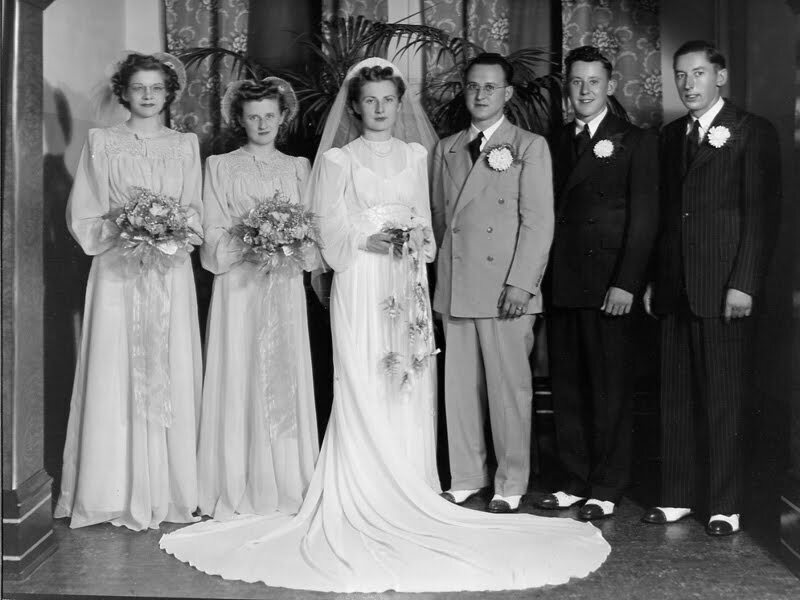 It was during this time, in 1941, that he and Luciel were married. Following their marriage, George worked for the Twin Cities Federal Ammunition Plant in Rosemont. 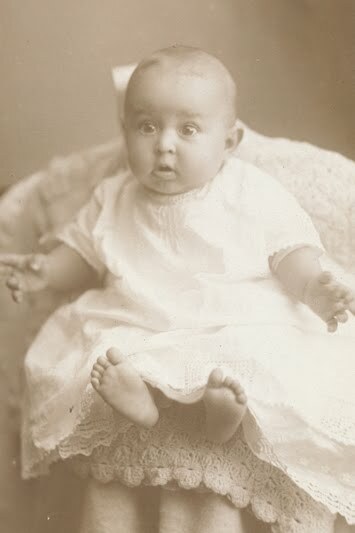 During WWII, George was called into the Army in 1943, leaving his wife and baby daughter who was only three months old. He was assigned to the 508th Ordinance Heavy Maintenance Company (field Army), attaining the rank of Technician 5th Class (Corporal). George’s job was to maintain military weapons. 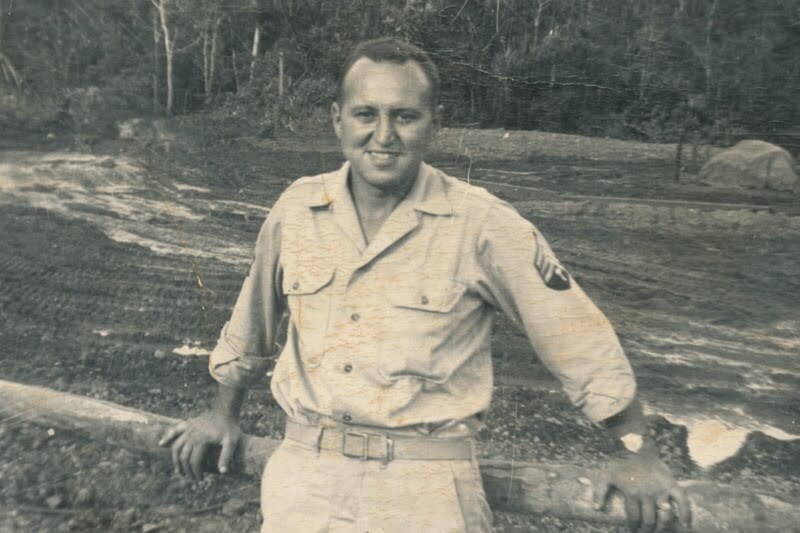 He served in the Pacific theater, stationed at Oro Bay, Papua, New Guinea, and in Leyte, Guam, Philippines. While being restationed by ship, George showed a bit of his humor by writing, Sea sickness was a problem with many, especially after having beans for breakfast! About their landing in the Philippines, he wrote, Our landing was made by amphibian trucks called “ducks” amid a bombing and strafing attack. I will not mention numbers of fatalities or others wounded. 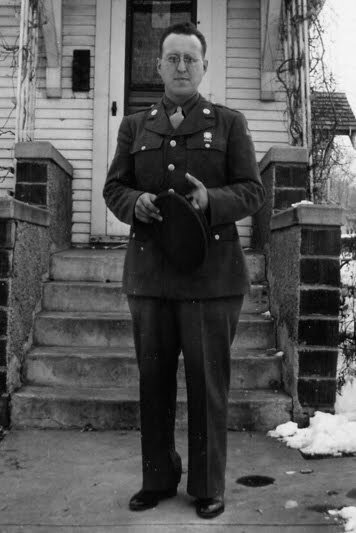 At the end of the war and after serving for nearly three years, George received an honorable discharge. He observed, My experience in the war showed me that in a war there is no winner—all losers. George then attended Gustavus Adolphus College in St. Peter, Minnesota, where he studied to be a pharmacist. 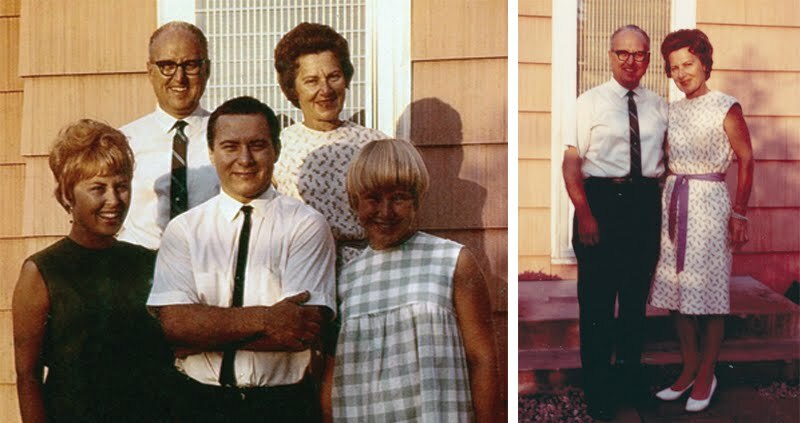 Because of his growing family, he left Gustavus and joined the Green Giant Company. 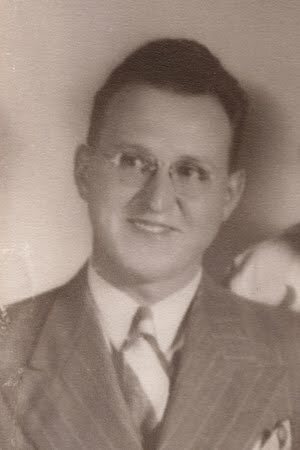 The company placed him in Cokato and Montgomery before moving him and his family to Le Sueur, Minnesota, in 1952. It was there where they remained for the duration of George and Luciel’s lives. George continued working with Green Giant, culminating in the position of Manager of Distribution, until his retirement in 1977. 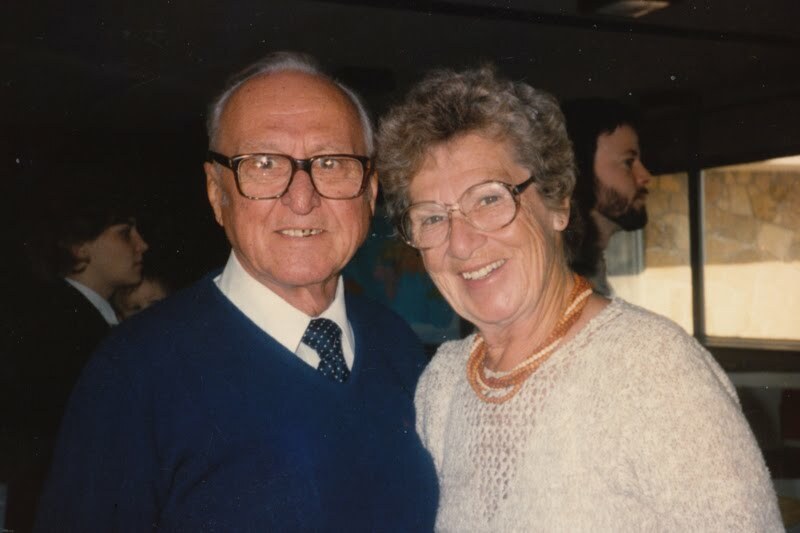 In his leisure time, because he was an avid sports fan, George attended as many sporting events as he could (was a season ticket holder for the University of Minnesota football team), and watched any and all sports on television. His wife often joked that he would even be happy to watch Henderson and Ottawa (small villages in the area), play Tiddly Winks! As a golfer and a member of the Le Sueur Country Club, he rarely missed a “Men’s Night.” He also was a long-time bowler. In testament to his Catholic faith, George was a member of the Knights of Columbus and the Catholic Order of Foresters. He and Luciel enjoyed traveling in the United States as well as in Europe and Mexico. They spent parts of many winters in either Majorca, Spain, or in Mazatlan, Mexico. George died suddenly from a heart condition in 1991, just six months shy of his and Luciel’s 50th wedding anniversary. The two are buried together in Fort Snelling National Cemetery, Minneapolis, Minnesota. This is the day we’ve been waiting for, for such a long, long time. We received the news this morning at the shop at about 9:00 that the Japanese had accepted our terms—of course at that time it could have been a rumor because it was just being passed from one guy to another. This noon, at 12:15, the news hour, the day room was packed with fellows listening to the radio! When the words “the fighting is over” came over the airways, the guys let out a yell so loud that you should have been able to hear it, started hugging each other, and literally went wild! After the news was over, I went back to the tent and laid on my bunk. I started praying thanks to God and before I knew it, tears started coming to my eyes—I was so happy for myself that I just couldn’t help it! My darlings, I can’t help but tell you that I’ve been like a baby most of the afternoon—I caught myself day dreaming of you and home several times and couldn’t seem to be able to get my mind on my work. I’ll have to snap out of that or I won’t be doing my share to get the work cleaned up so I can come home! I hope you won’t be expecting me to step off the boat one of these days because as you probably know, I’m a member of the service forces, and it will now be our job to clean up the place, process, and prepare for storage of all equipment! Of course I won’t be here ‘til the job is done, but I know I’ll have to help for a while—so just keep hoping and praying that the Lord sees fit for me to come back to you as soon as possible, my angels. I know it won’t be so very many months! I suppose soon censorship will be lifted and then I’ll be able to tell you all about everything that happened to me since I pulled out of San Francisco over 19 months ago—or would you like me to wait till I get back to you to tell you my story? I think maybe it would be more interesting to tell you in person! I didn’t receive a single letter from you for the past two days, my angels, so I don’t have anything to answer—but even if I did, I doubt if I could write about anything except in this one train of thought—the end of the war! Think I’ll go to the show tonight to sorta’ celebrate a little. I haven’t any beer and I won’t drink any of this rotten Filipino whiskey! I’ll have my real celebration when I get back to you sooner than soon—I hope and pray! I love you, my darlings, with all my heart and soul. I just can’t wait for the day to come when I will be back to you and tell you in person. Good-nite, my angels! Your most loving hubby and daddy—George.